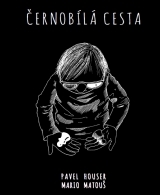 The most beautiful studies and problems of Mario Matouš, the best Czech chess composer of the 20th century, and bizarre chess stories of Pavel Houser connected by illustrations of Kristina Peřichová into one splendid book. The book was published also in limited numbered edition (100 copies), bound in imitation leather with an embossed diagram, paper cover and sewn ribbon bookmark. On 240 pages you will found 45 studies and problems, 22 stories and 36 illustrations. The book is supplemented by biographies of both of the authors and several yet non-published photos. 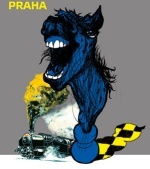 The book was published by Prague chess society in 2014. The book can be ordered at an e-mail address pavel.matocha@gmail.com. Please give your full name, address and phone number. [22.02.2019] - Chess train, a unique project of Prague Chess Society and Czech Railways, will take place again this year! The Chess Train 2019 will run from October 11 to 15 on the route Prague - Karlovy Vary (Carlsbad) - Český Krumlov - Brno - Trencin - Prague. On the train, a 11round tournament in rapid chess will be played. As it is clear from the itinerary, this year the real medieval pearls are waiting for the participants of the event - beautiful cities of the Czech Republic and Slovakia with picturesque historical centers. [17.10.2018] - Australian international master Guy West won the international chess tournament, with 10 points from 11 rounds, played during the five days long Chess train journey across the Czech Republic and Poland. Alexander King, American, and Ukrainian international master Roman Khaetsky finished second and third. Khaetsky, as a matter of fact, won the Chess Train tournament in 2017. [13.10.2018] - A bit like Harry Potter's classmates could have felt, the participants of the eighth Chess Train establishes magic in its journey. And not only because Prague is magical, as Ripellino wrote, but also due to the departure of the train from the 4? platform. [03.10.2018] - The Chess Train is going to start its eighth journey around the Central Europe next week already. Over 100 chess players have registered to participate (check the starting list), however few places are still available for those, who like to make a last-minute decision. [02.10.2018] - The eight year of the EY Blitz Tournament of Managers was won in the early Monday evening by Jan Hruška from ČEZ, who came ahead of the owner of a translation agency Jean-Francois Cantier and NNIP´s manager Michal Špaček. The guest of honour for the evening, held by Prague Chess Society in AdAstra Café, was a legendary Slovak chess player Ján Plachetka. [17.06.2018] - randmaster Navara led 5:4 in three games, but unfortunately he didn´t managed the finish line. On Saturday, Pentala Harikrishna won all three games and turned the game to his advantage. 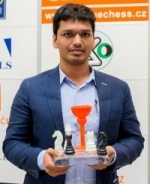 Indian Grandmaster won 7: 5 and took the trophy for CEZ CHESS TROPHY 2018 winner. On Sunday, the festival ends with the simultaneous display in Michna Palace on Kampa in Prague. [15.06.2018] - Bohuslav Schnirch, together with Josef Vaclav Myslbek, was the most significant Czech sculptor of the 19th century. For chess players, however, he is the first chairman of the Czech Chess Association and the author of the chessmen that are still used until these days. 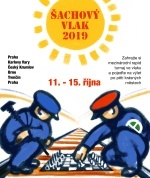 You can visit the exhibiton called „Sculptor Schnirch and the Czech club chessmen“ at the festival ČEZ CHESS TROPHY 2018 at the Michna Palace in Prague on Kampa.